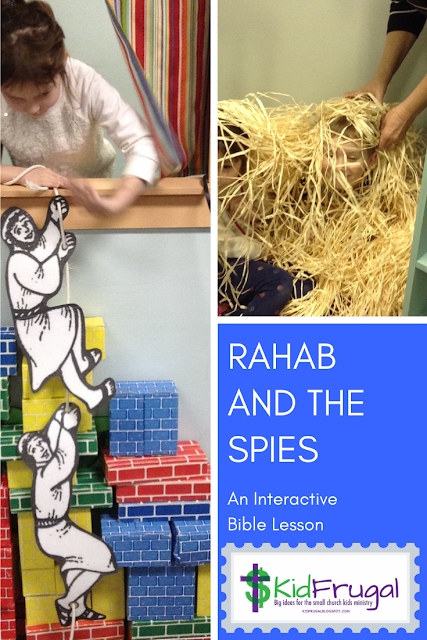 As promised, here is the rest of the story on Shadrach, Meshach and Abednego (or “into – bed-you-go”). I wrote a drama for this story that uses at least 10 people. You can use 20 or more since you need a crowd for all of the scenes. You can also do it with less than 10 people if you allow some people to have double roles. We used our adult teachers along with the students. Here is the link for the DRAMA. Here is the link for the IMAGE I used to make the golden idol. 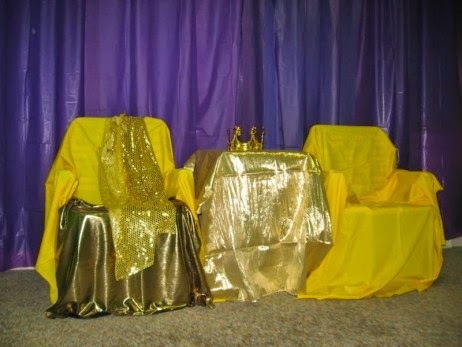 Scene One takes place in the throne room. I actually have created a throne room for other stories, but I did not think of doing it for this one. gold statue that Nebuchadnezzar had built. This is my favorite frugal prop. 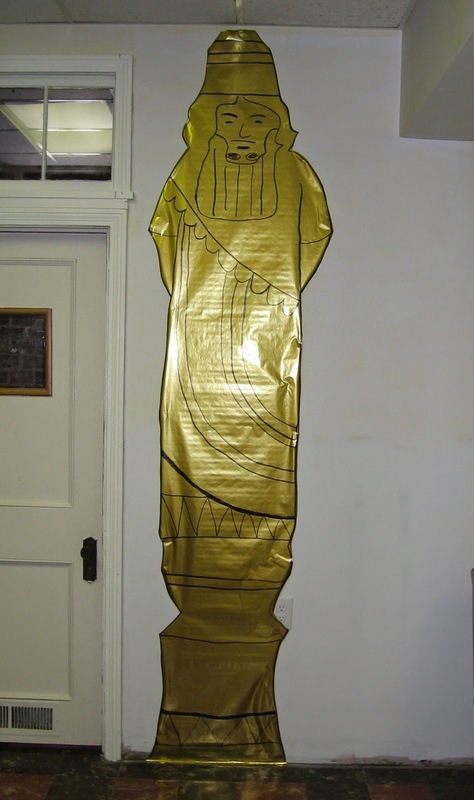 As I was thinking of how to visualize the statue, I remembered that we had a roll of gold foil Christmas paper at the church. Most rolls of wrapping paper have at least 19 feet on them, so you will have plenty to make a statue that goes from floor to ceiling. Next I found a really simple picture of the statue online. I printed it onto a transparency and then used a black sharpie to make the outline clear. I simplified the statue a little to make it easier to draw, and then taped the foil to the wall and using the overhead projector drew it. I was able to cut it out right on the wall. Here is the final product pictured at right. You could do the same thing with a computer and projector, but this is Kidfrugal. Our church only has one projector available, and it isn't for the children's ministry. The statue only cost a dollar or two since I got the paper on sale after Christmas at a Michaels craft store. What a bargain! When we did the drama, I downloaded trumpet fanfare ahead of time and played it at the appropriate time in the script. 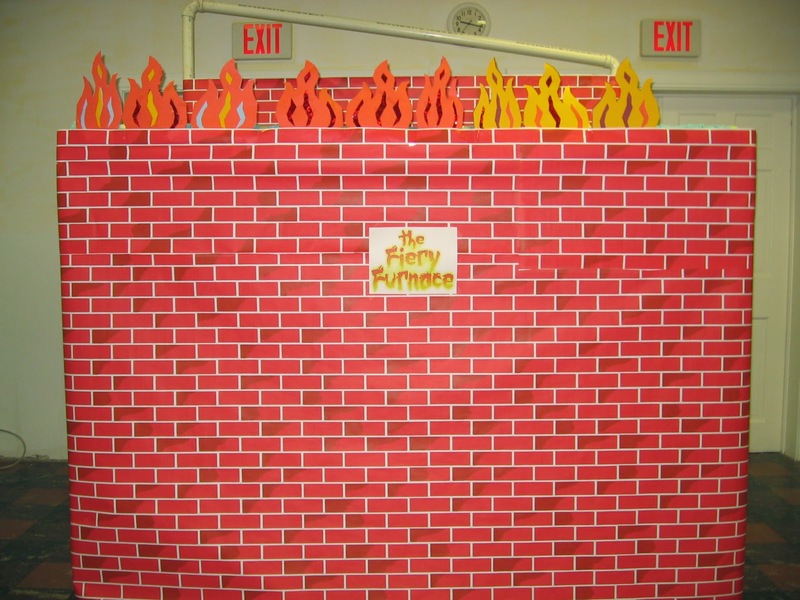 The last scene takes place at the fiery furnace. I wrote about how I made the furnace in last week's post. Here is a picture of it again.